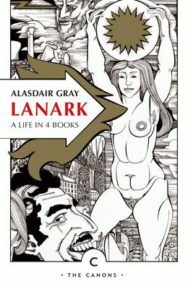 Any publication of new work by Alasdair Gray is a cultural event. 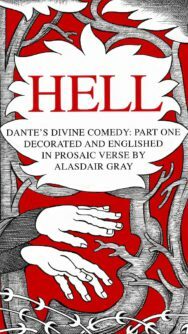 And when Gray announced he was translating Dante’s epic The Divine Comedy, we’re sure BooksfromScotland were not the only ones on tenterhooks waiting for publication. 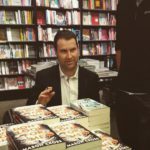 The first part of the trilogy, Hell, is published this month, with Purgatory and Heaven to follow. 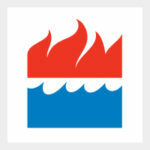 We’re delighted to share with you the first canto. I’ll tell you of it, if you care to hear. where we should travel by its heavenly light. through the long journey of that gloomy night. no living soul but mine had struggled through. so that each footstep raised me higher still. she sometimes nearly forced me to retreat. it seemed to terrify the very air. to climb up higher to a better place. cries out in vast astonishment and pain. till forced into the sunless wood again. and pleaded, crouching down before his knees. when the false gods were worshipped everywhere. and founded Rome. I was a poet there. of poetry derives from what you teach! I learned from you who are my dominie! 85 the brute whose threats have rendered me distraught! Master, please save me – show me the right way. 91 who lets none pass before she bites them dead. Her starving greedy lust is never sated. Her appetite increases as she feasts. whose fangs will end her life in deadly pain. not gold nor land nor any earthly gain. whose wars created Rome’s establishment. back in the place she came from, which is Hell. no second death will end their agony! for they will one day join the heavenly choir. 118 who made the whole celestial universe. are places that I cannot hope to see. 127 We walked. I followed as he led me on.